Farmer’s Market in Conroe adding vendors, music, and produce! 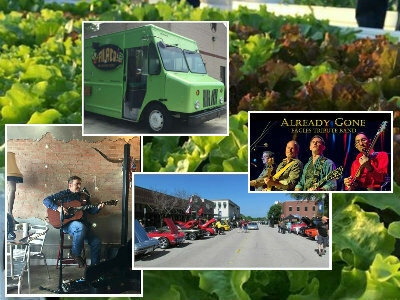 CONROE, Texas - The Isaac Conroe First Thursday Farmer’s Market will have new vendors with produce, food trucks, and music April 7, from 4-8:00 p.m., at Founder’s Plaza (205 Metcalf Street) in Conroe. The 2016 First Thursday Free Concert Series also premiers Thursday, two blocks down the street at Heritage Park with Already Gone, a tribute to the Eagles band. The opening band, Larry Tillery, will begin on stage at 6:30 pm. The Conroe Downtown Area Association (CDAA) sponsors the monthly Farmer’s Market for local vendors to display their homemade products and for the community to have the opportunity to purchase fresh local produce. Produce isn’t always easy to get with local vendors relying on the weather to decide when to plant and not lose their crop if we get a sudden freeze. The City of Conroe sponsors the free outdoor concert also on the First Thursday of each month April through September. New to the event this week is Benson Bunch Farm in Huntsville. They will be bringing a selection of organically grown vegetables including carrots, turnips, Swiss chard, collard greens, kale, onions, Bok choy, broccoli, and even pastured chicken. A few local favorites at the market are Bits and Bobs-handmade jewelry made from vintage pieces to make unique looks, Texas Gypsy- organic lotions, soaps, and mustache lotions, Mockingbird Baby-homemade baby boutique items, Griffith Meadery, Nyokas Oils, Lynne’s Country Lane, and the Zipper Lady. Michael Player a local Willis musician, will play live Southern country rock on the Founder’s Plaza stage. “I’ve been known to play a little bit of Eagles music to go with the theme of the band playing at Heritage Park this week”, said Michael Player. Learn more about Michael Player at www.Reverbnation.com/MichaelPlayer. Vendors, music, and even food! The Isaac Conroe Farmer’s Market always has food trucks and this week will not disappoint. On the street will be Cousin’s Maine Lobster, Skye Café, Burgers and More, Falacos (a new vegan/gluten free truck), Snowcone Angels, and Creole Gold. Attendees can choose Cajun, seafood, burgers, comfort food with a natural twist, natural fruit snow cones, or a totally vegan variety in the form of taco balls. “This is my first event with my new food truck, Falacos, and I will have a ribbon-cutting in the street to mark the occasion”, said Falacos owner, Courtney Weidner. “To my knowledge, we have the only total vegan/gluten-free food truck in the county. People have been slamming me to get this going, and it’s been a year in the planning”. Also new to the market, the Conroe Cruisers will have a group of 20-30 vehicles parked on Metcalf hoping that the community comes out to see their restored vehicles. The Conroe Cruisers are a group of local enthusiasts that meet for weekly “cruis-ins,” and give back to the community through a scholarship program to advance learning in car maintenance for youth. For more information visit www.ConroeCruisers.com. Come for the Farmer’s Market in Founder’s Plaza at 4:00 p.m., and then stay for the concert two blocks down in Heritage Park at 6:30, starring Already Gone & the Larry Tillery Band, in historic downtown Conroe! (See related link First Thursday Free Concert - Already Gone & Larry Tillery Band. The entrance at San Jacinto Street will be open for participants to stop and get a bite from one of the food trucks before entering Heritage Park. Kids will enjoy the inflatables in the park! Additional vendor booths are available by contacting Margie Taylor at 936.828-6881, or emai ExperienceDowntownConroe@gmail.com, or downloading the application at www.ExperienceDowntownConroe.com/news. All proceeds benefit the Conroe Downtown Area Association and their mission to enhance the downtown Conroe area with events, tourism, and increased traffic to the merchants. For more information visit their website and their First Thursday Farmers Market Conroe Facebook page. Read about last month's Conroe Farmer's market too at Conroe Farmer's Market March 3 (see featured videos).